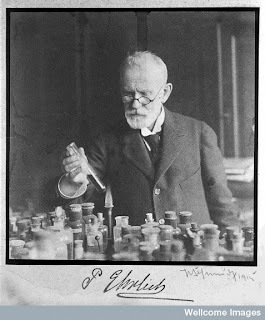 Paul Ehrlich (1854-1915) was a leading medical researcher of the late nineteenth and early twentieth centuries particularly famed for his work in bacteriology and immunology. He won the Nobel Prize for Medicine in 1908. He is best remembered for ‘Dr Ehrlich’s Magic Bullet‘, Compound 606, the arsephanemine drug salvarsan discovered in 1909, which provided a cure for syphilis,. There are 6 series, representing both copies of letters sent by him, and experimental notebooks. There are not complete sets of transcripts for all of these: in some cases the originals themselves appear to no longer exist. 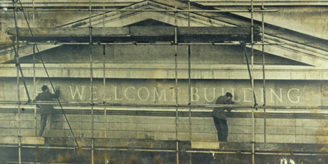 According to a letter from Dr E A Underwood, Director of the Wellcome Historical Medical Museum, to Gunther Schwerin, 25 Mar 1963 (WA/HMM/CO/Eau/13), there are some misreadings by Marquardt of scientific terms in the originals, as, although she was capable of deciphering Ehrlich’s writing, she was not herself a scientist.